The WetVegEurope project is scientifically supported by the European Vegetation Survey (EVS) and involves collaborators from most European countries. 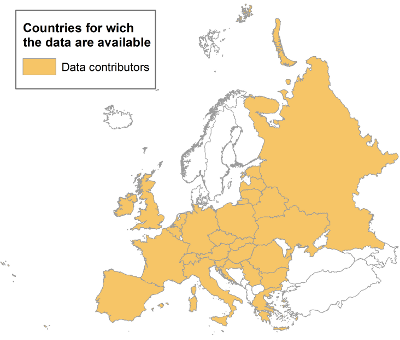 Currently the project involves data contributors from 25 countries. Liene Aunina (LV), Claudia Bita-Nicolae (RO), Aleksandr Bobrov (RU), Lyubov Borsukevych (UA), Andraž Čarni (SI), Milan Chytrý (CZ), János Csiky (HU), Els De Bie (BE), Dmitro Dubyna (UA), Panayotis Dimopoulos (GR), Tanya Dzyuba (UA), Úna Fitzpatrick (IE), Xavier Font (SP), Daniela Gigante (IT), Valentin Golub (RU), Stephan Hennekens (NL), Richard Hrivnák (SK), Svitlana Iemelianova (UA), Ute Jandt (DE), Florian Jansen (DE), Zygmunt Kącki (PL), Konrad Lájer (HU), Dalytė Matulevičiutė (LT), Attila Mesterházy (HU), Jaanus Paal (EE), Alessandro Properzi (IT), Vladimir Ranđelović (RS), John Rodwell (UK), Joop Schaminée (NL), Urban Šilc (SI), Zofija Sinkeviciene (LT), Aleksei Sorokin (RU), Zvjezdana Stančić (HR), Boris Teteryuk (RU), Tiiu Trei (EE), Rossen Tzonev (BG), Roberto Venanzoni (IT), Lynda Weekes (IE), Wolfgang Willner (AT). OTHER EXPERTS: Lorenzo Lastrucci (IT), José Antonio Molina (SP), Eva Papastergiadou (GR), Igor Zelnik (SI). The research grant to Flavia Landucci for 2013-2015 is financed from the SoMoPro II programme. The research leading to this invention has acquired a financial grant from the People Programme (Marie Curie action) of Seventh Framework Programme of EU according to REA Grant Agreement No. 291782. The research is further co-financed by the South-Moravian Region. See further information about this project at WetVegEurope. The main aim of this project is to develop a formalized classification of marsh vegetation (class Phragmito-Magno-Caricetea) and freshwater aquatic vegetation (classes Lemnetea and Potametea) across Europe to the level of phytosociological associations. This work is based on a large set of phytosociological relevés collected across Europe, mostly extracted from national or regional databases. Each association will be formally defined using a logic formula and characterized in terms of ecology, distribution and nature conservation status. The whole classification system will be implemented in a computer expert system for automatic identification of vegetation types in data sets of individual relevés. The IAVS Vegetation Classification Methods Website, conceptual and methodological help for anyone aiming to create or use classifications of vegetation. The information published in this website reflects the author's views. The European Union is not liable for any use that may be made of the information contained herein.